Det. Ray Morgan (Daniels) is an LAPD Cop On The Edge. After the pursuit of a suspect, Morgan and his team of detectives, Boorman (Maurice Lamont), Grant (??? ), Vasquez (Frank Rivera) and Chang (Kelly Hirano) - as well as Morgan’s devoted friend and partner Cassidy (McKinney) - open fire on this very dangerous and violent criminal. After killing him, evil mob boss Vincent Sloan (Foronjy) declares war on the cops, with a particular emphasis on Morgan and his family. Vincent’s son Marcus was killed in the police shooting. After losing everything at the hands of Sloan and his goons, Morgan has nothing left to lose and devotes his life to revenge - with awesome results. Gary Daniels once again brings the potent combination of likability and top-notch martial arts skill in his role as Ray Morgan. He’s another lovable family man (his wife is played by Kelli McCarty), forced to fight to even the score. Frankly, Recoil is one of the best PM’s we’ve seen to date. It’s nothing but action and incredibly impressive stunts, and with an interesting religious subtext. It’s very tough as well and takes no prisoners. 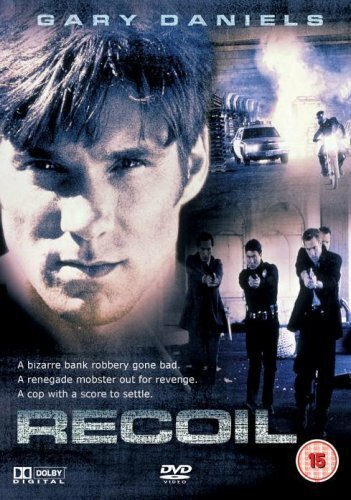 With fan-favorite Gary Daniels at the helm in this revenge thriller, Recoil can basically do no wrong. The sinister Sloan family proves no one named Sloan or Sloane is any good. Interestingly, the family seems like an Italian crime family, made up of men from mobster flicks - perhaps they shortened their name from Sloanelli or something like that. It’s hard to believe director Art Camacho also directed the dire Deadly Reckoning (in the same year, no less). But then again, here he had the power of PM to back him up. Clearly his years in the action movie biz gave him the ability to know what fans want and how to deliver a satisfying action production. While the overall tone is somewhat cynical, or perhaps nihilistic, and way too many cops die in the film for our liking, Recoil remains an entertaining, uncompromising and fully engaging movie, one of PM’s best. Yeah, this is one of Daniels absolute best films, one of the things about this film that really surprised me is how many similarities it had to the 2004 Punisher film, makes you wonder if the filmmakers were inspired by this film. Need to re-watch this. Think it was the first PM movies I ever watched. I remember it kicks in at the start with a chase sequence that goes on for nearly 30 minutes non-stop. Jack: It is definitely worth a re-watch for the climax alone. The chase is pretty long and but still very entertaining. Mr. Gable: We know you will love it! Gary Daniels at his best. 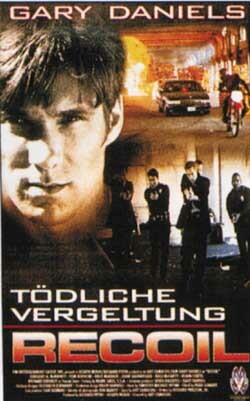 Yup, I too regard this as one of my favorite Gary Daniels flicks. I found the action scenes to be above the usual standard for this kind of films. Definitely agree with you. Gary Daniels brought his A-game to this one. Loved the climax when he was out for revenge and destroying everybody!